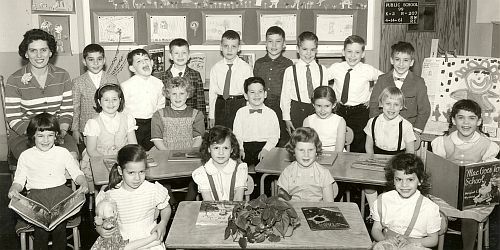 A Picture History of Kew Gardens, NY - Class Pictures - PS99 Kindergarten 2 1961. "In the first row 3ed from left is Debbie Rothstein, 2nd row 2nd from left is Me, Susan Politzer, next to me Susan? (can't remember her last name) Back row of boys 3ed boy from left is David Glassner. Teacher is Mrs Bierman." "The boy in the 3rd row on the viewer's right looks like my brother Lawrence Abend." Please email me if you can identify any of the people in this photograph.